Physician-nurse communication failures have adverse consequences for patients, including the possibility of medical error. This study reports the effect of creating unit-based care teams on the quantity and quality of patient care communications between pediatric residents and nurses. After the intervention, residents admitted and cared only for patients on their assigned unit, and no other teams admitted patients to these units. As a result, contact between the resident and the patient's nurse increased markedly and the number of pages decreased by 42.1%. Residents and nurses knew who was responsible for care of the patient and concerns were addressed in a more timely fashion. Further research should continue to elucidate the ways that specific changes in physician-nurse communication can improve inpatient pediatric care and directly measure the effects of such reorganizations on patient safety outcomes. Physician-reported communication with nurses. The preintervention period was April 1 through June 30, 2008. Postintervention period 1 was December 1, 2008, through March 31, 2009. Postintervention period 2 was April 1 through June 30, 2009. P values are for the overall measures of effect across time points. Medical emergency teams (also called rapid response teams) have been instituted in many hospitals as a method to rapidly treat patients who are deteriorating and to prevent cardiopulmonary arrest and other adverse outcomes. However, the true effect of these teams is unclear. This study compared changes in hospital mortality in 2 published studies with changes in mortality during the same period in a hospital that did not have such teams. The authors found statistically significant decreases in the hospital mortality rate over the periods of the 2 published studies reporting this positive outcome and found no significant change over time in the ward's cardiopulmonary arrest rate, similar to the 4 published studies reporting this outcome. This finding demonstrates the limitation of before-and-after study designs (cohort studies with historical controls) in determining the effect of rapid response team implementation and the need for a large cluster-randomized controlled trial to determine effectiveness. 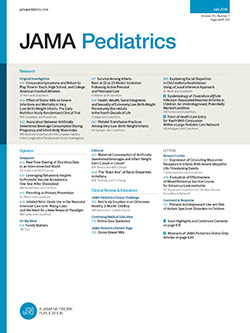 Medically complex children require an increasingly large portion of inpatient and emergency department care in children's hospitals and account for a large portion of the overall pediatric health care costs. The initiation of a medical home program for these children, using multidisciplinary teams and improved coordination of care, resulted in a significant reduction in costs of care. There was a significant decrease in the likelihood of admission and a shorter length of stay for those who were admitted after the initiation of the new program. This resulted in an annual savings of $1766 per patient per month for children enrolled in the program. Future research is needed to determine whether the coordinated and comprehensive care resulted in better patient quality of life and health status as well as improvement in the quality of life, mental health, satisfaction with care, and general well-being of their care providers. Improving the quality of primary care has been increasingly advocated as a strategy to reduce preventable health care use, especially among children with special health care needs. This study found that less than 30% of parents reported that their children received high-quality care in all 3 domains of family centeredness, access, and timeliness. Parent-reported low-quality primary care was associated with higher rates of nonurgent emergency department visits and hospitalizations for children with special health care needs. Low-quality family centeredness was associated with a higher rate of nonurgent emergency department visits. For children with private insurance, low-quality family centeredness and low-quality realized access were most strongly associated with higher rates of hospitalizations. Overall, these results provide new understanding on the relationships between the quality of primary care and high-acuity health care use among a vulnerable group of children.